- Discounts on wagyu croquette and soft serve ice cream at Mt. Usu ropeway. Discounts at Restaurant memere are not accepted on Wednesdays. Spend a full day exploring the scenic vistas of northern Japan’s most famous lakes, with audio guides in English, Chinese, or Korean. First up is Lake Shikotsu, well known for the crystal clear clarity, you can enjoy an optional cruise over the shining waters here. Next up is Lake Toya, a caldera lake formed by a large volcanic eruption over 100,000 years ago. Its water is rich in minerals. This bountiful nature makes it home to a wide variety of flora and fauna. Gaze at the glass-like surface of the lake as you enjoy lunch at Toyako Manseikaku. Mt. Usu, the first designated UNESCO Global Geopark in Japan, is on the way, and once at the summit, you can get amazing views in the fresh air. Snap photos of the other mountains and the open ranges. Explore the area around Lake Shikotsu and take an optional cruise as you enjoy the scenery of Hokkaido. The cruise departs at 10:10 and a 30-minute boat ride can be enjoyed. Enjoy lunch and free time at this beautiful lake-side hotel. There is a resting space for participants. Towels are not included. Face towel + Bath towel rental JPY 300. Close to the volcano's summit, the observation decks offer gorgeous views of Lake Toya, neighboring Mt. Showa Shinzan, the Pacific Ocean, and Mt. Usu's largest crater. Enjoy 360-degree panoramic views of the picturesque Lake Toya, the Nakajima Isles, Mt. Showa Shinzan, Mt. Usu, and much more! Another scenic photo opportunity of the surrounding Hokkaido mountains including Ezo Fuji or the "Mt. Fuji of Hokkaido". If you wish to book a seat for an infant under the age of 6, please select 'Child 6-11'. Each infant under the age of 6 must be accompanied by one adult. 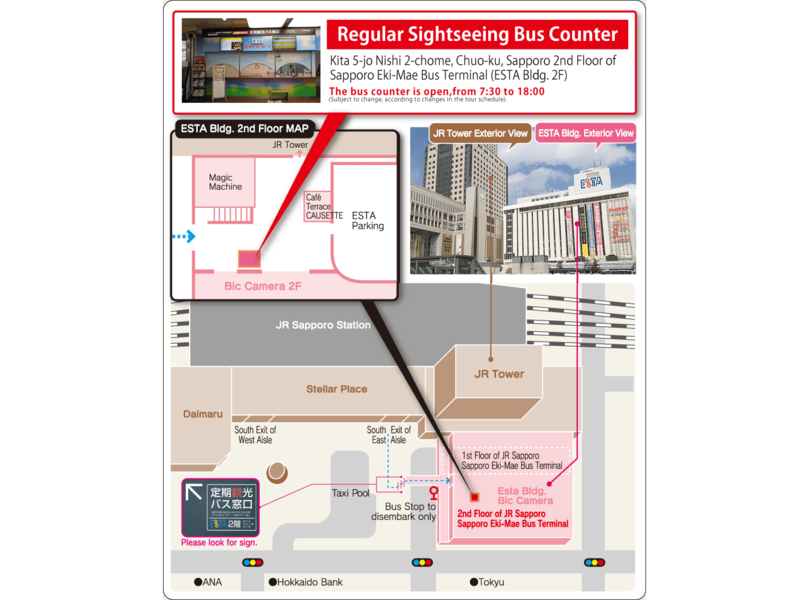 Please exchange your VELTRA voucher for a bus ticket at least 15-minutes prior at the bus terminal check-in spot. Please wear comfortable shoes and clothes that are easy to move around in. Depending on traffic or bad weather, the return bus to Sapporo Station may be delayed. Please allow enough time to make connecting transfers. Tours may be cancelled due to bad weather or road closures. Please contact the tour operator to reconfirm the operation in the event of inclement weather. In the case the ropeway does not operate due to strong winds and bad weather, you will receive a souvenir. Large pieces of luggage such as suitcases can be stored in the trunk of the bus. Please ask the staff prior to boarding. Please make sure not to leave valuables in the stored luggage and bring it with you on the bus. Lunch will be a Chicken Soup Hot Pot Set: Salmon baked with egg, Japanese mustard spinach tossed with sesame, rolled cabbage and two kinds of vegetables. Chicken hot pot contains nappa cabbage, chrysanthemum leaves, enoki and shimeji mushrooms. Sautéed onions and corn egg custard, scallops fried in bread crumbs, shishamo smelt fried with seaweed, shishito peppers, potato salad, white rice, clam miso soup, two kinds of cake. Show your bus ticket stub at the Shikotsu Lake Cruise (glass-bottomed boat) and receive a 10% discount on the fare. Adult 1,200 JPY, Child 600 JPY. The boat departs at 10:10 and the tour lasts 30 minutes. *Only for tours running between Apr 22 - 26, May 7 -Nov 4. Any cancellations made after 2 hours prior to the activity start time will be subject to a charge of 100 yen.